This year's Ashes series has been flooded with controversy of the DRS system, and it has taken a lot of spotlight - in fact far too much than it should have. While the rain is something of which is harder to control, the DRS speculation is running rampant amongst cricket fans. These controversial decisions have turned the focus from the cricketers to the umpires, something of which should be a very rare occurrence with technology that should be used to keep games fair. While the job of the umpire is one of the hardest in a game such as cricket, the technology is used to aid the umpires, not contradict them. Another umpiring device, hot-spot, has been a recipient of much criticism. It allows the umpire to see if a batsman has edged the ball, but in picking up these small hits it has seemed to fail. Matt Prior and team-mates thought that they had David Warner out when it seemed he edge the ball on Day 4 of the Third Test, but Tony Hill gave it Not Out, and hot-spot agreed on that occasion. Player reviews serve the purpose of allowing fair decisions to be called in cricket, it is acceptable that an umpire can't be perfect 100% of the time, but the reviews should be pretty much impeccable for fair decisions. But the fact that reviews are being lost because of technology failures should not be an occurrence, players should be allowed to trust the review system for giving them fair outcomes. At home watching, it is evident for cricket fans that the umpire has made a wrong decision, the fundamental purpose of the technology is to correct these decisions, but this has not been the case. The problem is that the DRS System has been the buzz news topic about The Ashes, rather than the cricket itself. One piece of modern technology used for a cricket problem is the flood lights that deal with lighting the ground for when there is bad light. Yet umpires Hill and Marais bewildered players when they called of play at half four due to bad light, although the flood lights were on. If the flood lights are used to deal with bad light, but play is called off for bad light, then what purpose does it serve? Another discussion is that it is down to human error. The technology may do it's job, but maybe the umpires themselves are making the mistakes. The DRS System has done the opposite of what it's supposed to do, it has created problems rather than solving disputes, it has dampened the spirits of those watching cricket, and even worse, those playing it. In order to possibly deal with the problems, a clear set of regulations should be introduced, this is because leaving it down to someone to always make the decisions creates too much human error. One issue that was thrown around - maybe with much less seriousness - is the introduction of roofs in cricket. This would be a logical way to deal with the problem of the rain but it won't work. Cricket stadiums are designed to be open, putting roofs on there would be a costly and difficult task. While we cannot really do an awful lot about the rain, the technology is something we can do a great deal about. 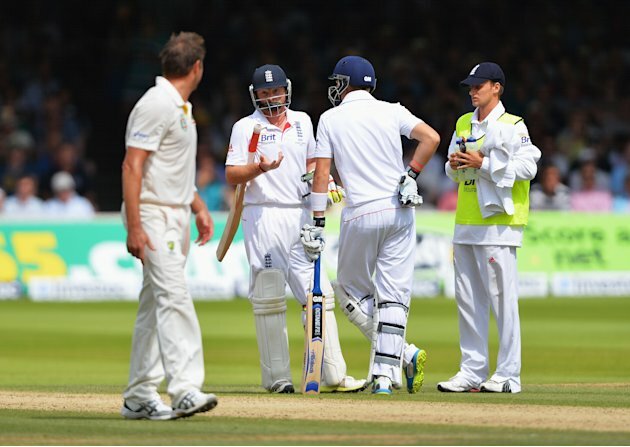 Stuart Broad was under much criticism when he decided not to walk off when he was ruled not out. It however appeared that he had a thick edge that went off the keeper's gloves into Michael Clarke at slip. But Australia had no reviews and Broad did have the right to stay but with something so evident this should not be an occurance. England batsmen Ian Bell only totted 3 runs when he was caught by Steven Smith. On-field umpires gave the decision to the Third Umpire, who controversially ruled in the batsman's favor due to the seeing conditions from the lens. Other hot-points that have seen umpires rule or controversially rule against players are Steven Smith, Ashton Agar, Johnathon Trott and probably the most renowned case in Usman Khawaja. This has been one of the most controversial Ashes series since it's introduction in 1882, and it has not been the traditional cricket that has been the hot topic, it has been the modern technology only recently introduced. With The Ashes now an imminent draw or win for England, the hosts have retained the prestigious urn, but has this been because of some major umpiring decisions? Two tests now remain in The Ashes series. The prestige of the 131-year-old series has not been taken into account amid the controversy abuzz the cricketing World. As a cricket fan, I hope the rest of The Ashes is not determined by human errors from the DRS system, but defined from the fine cricket that has been played through history since 1882.